Toronto wedding photographers are always looking for scenic places to photograph on the wedding day. The city of Toronto is fully aware of this and more places than not require a permit. 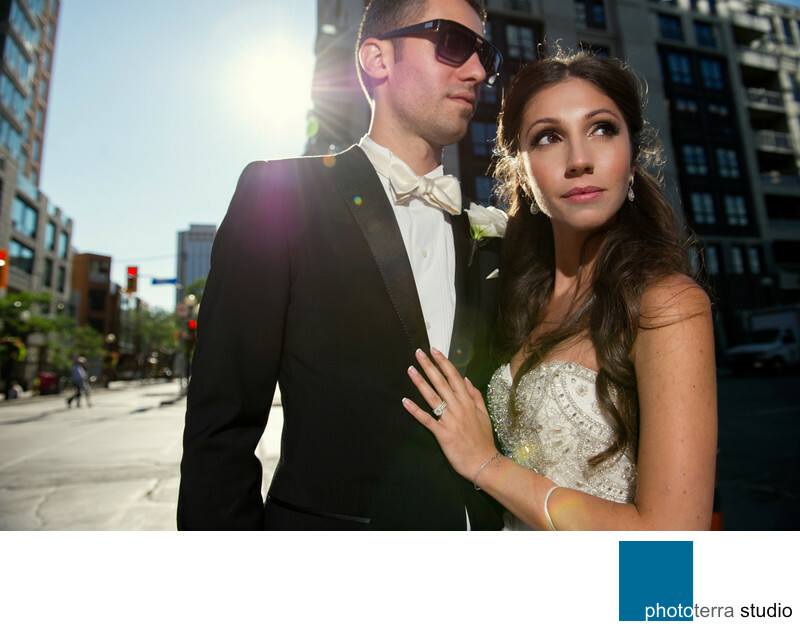 The city further complicates the situation by issuing permits to engaged couples only and not to wedding photographers. Street photography around Toronto is still permitted, but not everyone is comfortable taking photos on the streets. Brides and grooms are concerned with the background and photographers feel more at ease in secluded places. Well, this photograph was taken on Bay Street, in the heart of Toronto's financial district. "What is so special about the background? ", one may ask. Absolutely nothing! It is not the background that makes this photo, it is the couple. If the newlyweds are comfortable with their wedding photographer and trust his or her expertise knowing that their expectations were properly communicated in advance, they feel more at ease. Then the images will portray the true nature and beauty of the couple regardless of the background.